Puxsutawney Phil, hamming it up -- hogging it up? -- in 2013. After a polar vortex swept through Pennsylvania, Punxsutawney Phil has come to the rescue. Punxsutawney Phil didn’t see his shadow on Saturday morning, meaning Pennsylvanians can expect an early spring — if they believe a groundhog, that is. Was that loud boom in South Philly earlier this week caused by a frost quake? 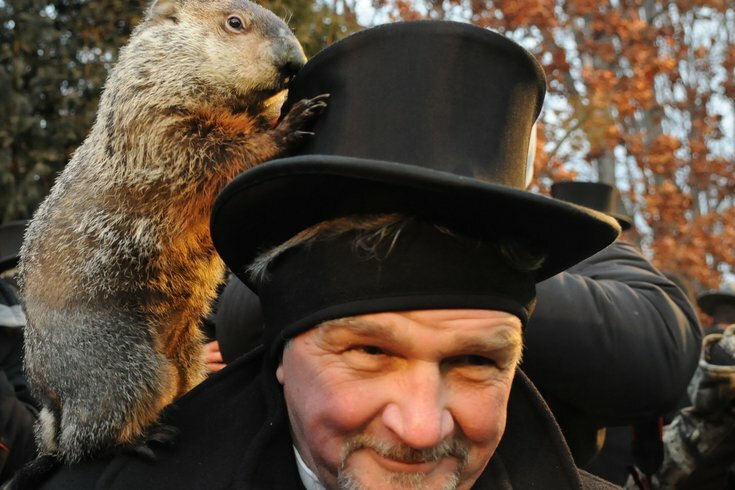 The illustrious Groundhog Day, which is celebrated every year on Feb. 2, is a unique Pennsylvania-based tradition which dates back to the 19th century. If Punxsutawney Phil sees his shadow, the legend goes, there will be six more weeks of winter. If he doesn’t, which he didn’t, an early spring is coming. According to Visit Pa., the event draws nearly 20,000 people to the town of Punxsutawney, which has a population of less than 6,000 during the rest of the year. When Phil was taken out of his hut this year, the event’s MC for some reason uttered this phrase: “All hail groundhog supremacy.” I have no idea what that means. Eventually, he "prognosticated" an early spring, and everyone in Punxsutawney rejoiced. In short, it was another very weird day celebrating a very weird holiday. It’s going to be 61 degrees in Philadelphia on Tuesday.